Kronan Throwdown Series present yet again a brand-new concept! Origination from our new and very popular Master & Junior Edition, we now give you the possibility to find the strongest team across decades. We promise well thought thru events with focus on teamwork, and with 2 judges per team, so everyone is going to work. 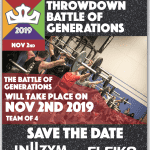 All ages must be met on competition day the 2th of November 2019. Put together your team and join this new exciting concept. We promise a professional competition with high standards. To secure the quality, we have limited amount of spots open in each class. OBS: You don’t need to have the whole team ready when registration of your team. Just 1 person can register the team. Prize only 2996 SEK per team = 749 SEK per person. This is including an Eleiko Athlete t-shirt with competition logo to everyone, worth 275 SEK. Furthermore, great prizes from our sponsors.